Event Description: A majestic site for a corporate team building event in the center of America’s capital, the National Mall is THE place to go for commemorating presidential legacies, for honoring our nation’s veterans, and for celebrating the nation’s commitment to freedom and equality. The National Mall has all you could want in a treasure hunt location: towering statues, intimate memorials, fountains, sculptures, and history. In his 1791 plan for the future city of Washington, D.C., Pierre L’Enfant envisioned a garden-lined “grand avenue” approximately 1 mile (1.6 km) in length and 400 feet (120 m) wide, in an area that would lie between the Capitol building and an equestrian statue of George Washington to be placed directly south of the White House. 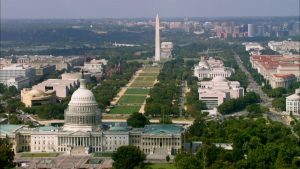 Although this plan never quite happened, the resulting National Mall is still quite a stunner, home to more than 80 historic structures and over 150 major named historic parks, squares, circles and triangles…not to mention 3,000 Cherry trees from Japan. During your corporate team building treasure hunt… expect to visit many of the “big” sites (Lincoln Memorial, Vietnam Memorial, etc) as well as a variety of little-known treasures: a celebration of women warriors; an island of Declaration signers; a giant representation of Einstein, and much, much more.